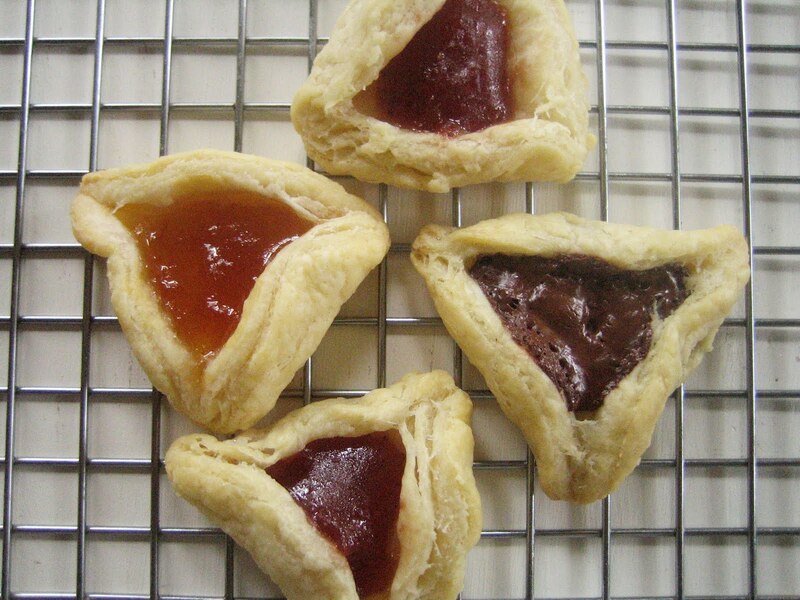 Blue Kale Road: Hamantaschen: Purim Is Just Around the Corner! Get out the masks and groggers (noise makers)! Purim is a merry holiday celebrating Queen Esther and Mordecai’s victory of saving the Jews of Persia from the wicked Haman. In synagogue, we gather to hear a lively telling of the story of Esther during which we sound groggers every time Haman’s name is mentioned. It is a noisy, joyous time filled with costumes, carnivals and exuberance. Purim also means it’s time for hamantaschen baking. Hamantaschen are scrumptious pastries stuffed with various fillings such as fruity jam, chocolate, prunes or poppy seeds (our favorite is apricot jam). 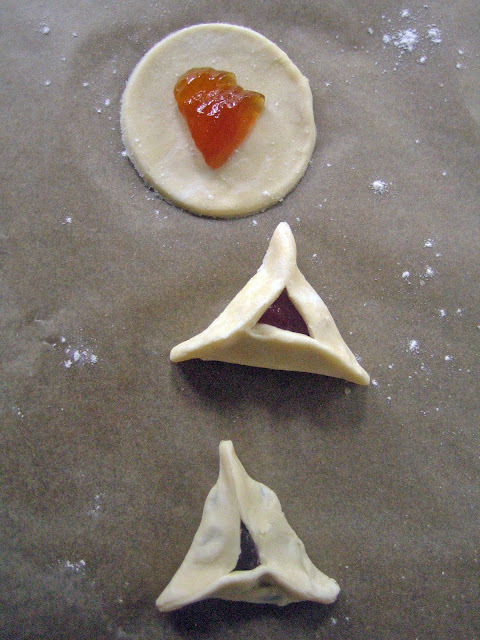 Apparently Haman wore a tri-cornered hat which is why hamantaschen are shaped like triangles. There is a lovely tradition of sharing gifts of shalach manot with others – little baskets or bags filled with fruit, nuts, candy and, of course, hamantaschen. Baking dozens of hamantaschen also gives us the chance to use up our flour before Passover begins next month. The classic recipe for hamantaschen is much like sugar cookie dough. For the past fifteen years, though, I’ve been baking flaky, light hamantaschen using a simple dough recipe I found in our local Jewish newspaper. It contains only three ingredients - cream cheese, flour and butter - and yields a rich, flaky pastry similar to rugelach, a favorite cookie of mine. 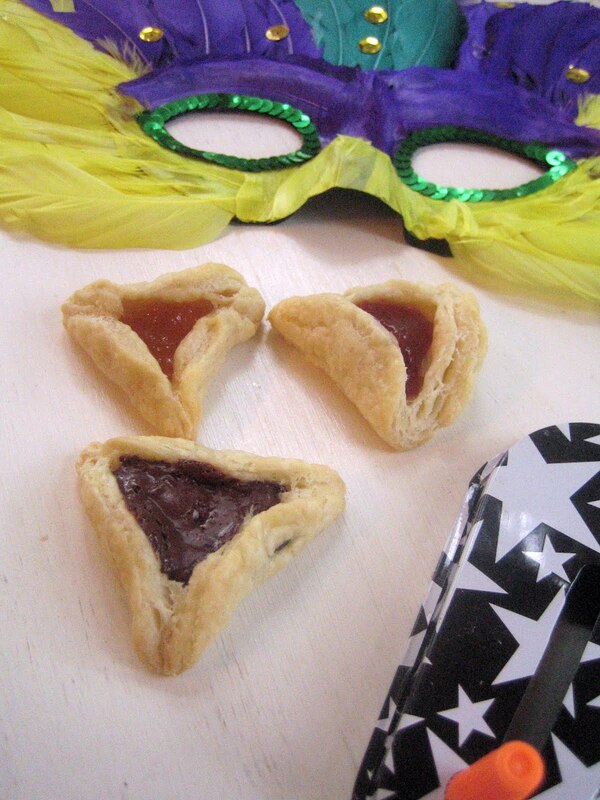 Chag Purim Sameach (Happy Purim)! In a large mixing bowl, beat the cream cheese and butter together until smooth. On low speed, slowly beat in the flour a little at a time until a dough is formed. Shape the dough into a disc and wrap in plastic wrap. Chill the dough for at least 2 hours or overnight. Preheat the oven to 375 degrees. Line a baking sheet with parchment paper. Lightly flour a surface to roll the dough. 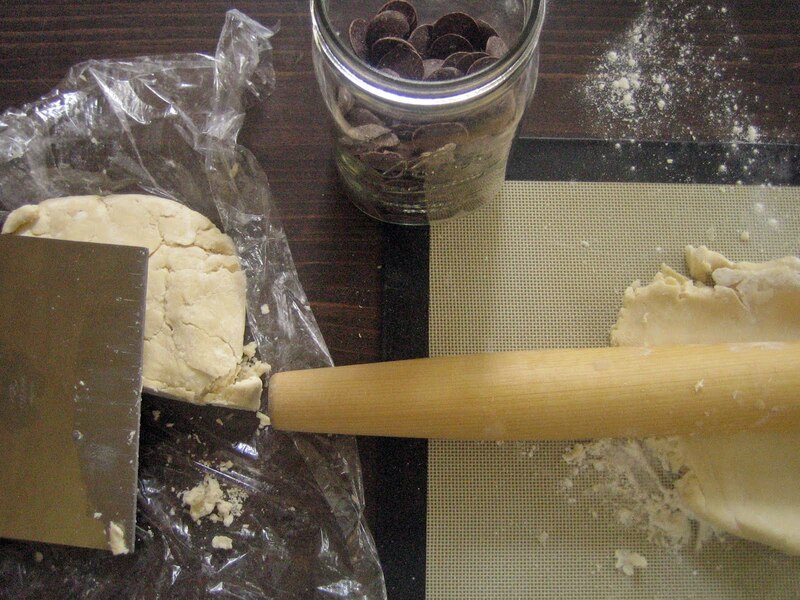 Remove the dough from the fridge and cut off 1/4 portion of it. Have a small bowl of water ready. With a floured rolling pin, roll out the dough to roughly 1/8 inch thickness. 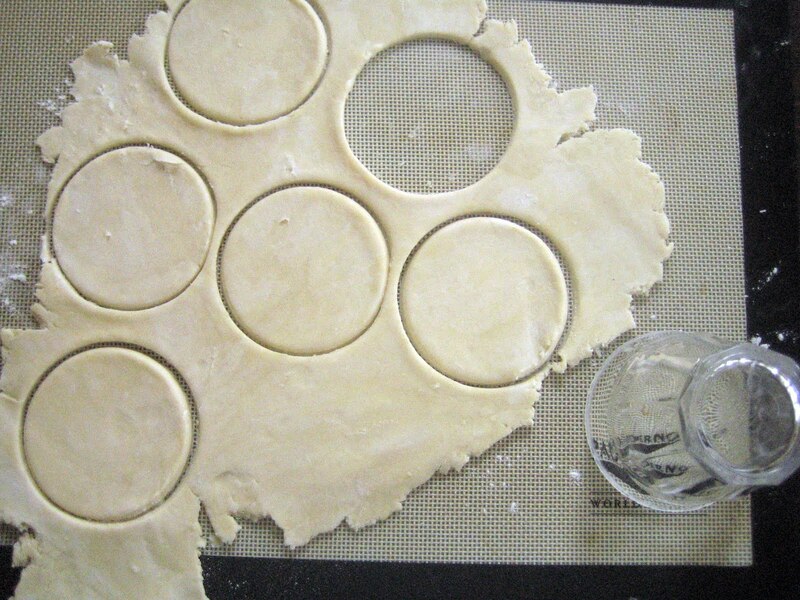 Using a drinking glass or round cookie cutter, cut the dough into 2 1/2 inch circles. Place a few chocolate discs or a teaspoon of jam in the center of each circle. Dip your finger in the water and run it around the perimeter. Bring the edges of dough together to form a triangle around the filling and pinch the 3 corners together tightly to seal. Place 10 or so cookies on the prepared baking sheet. Bake for 12-13 minutes, until the cookies are puffed and just starting to look a little golden. Remove to a cooling rack and let cool before indulging in them. Repeat baking until all the cookies are done. I love hamantashen, these are beautiful. Have always wanted a good recipe thanks for posting this. Thank you, Suzanne! I hope you enjoy them - they're always a fun treat to indulge in. I keep telling myself I need to make some Hamantaschen and haven't gotten around to it. This will be the year (plus, I can't resist anything with cream cheese). You're making me hungry! Yum! These sound a lot like kolatches! Cream cheese is magical in dough, isn't it? So true, Brooke - cream cheese works wonders in dough! Happy Purim to you too! This is absolutely lovely Hamantaschen, especially the fact that dough doesn't have any sugar works for me. That is such a simple recipe! Your hamantaschen look really tasty. Thank you, Brianne - I do love the simplicity of the dough. Have you ever used the dough for something savory, like blue cheese and apples? Thank you, Venessa! It is indeed a busy time, especially when I think of Passover approaching quickly. Hope you had a fun Purim celebration! You have so many great traditions, these look like quite delectable little morsels & especially love the sound of that pastry. Thank you, Mairi! The pastry is a wonderful one and I've used it in crescent shapes with various fillings during the year.